Dreambuilder Custom Homes is pleased to announce the completion of Dreambuilder Fourteen: a master shower remodel for the McElyea family in Orange Park, FL. This Eagle Harbour family had a large but dated master shower that needed style – but more importantly, they needed a place to easily care for their special-needs child. 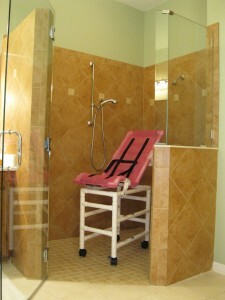 The current shower, with a raised curb and 2’ wide door, prevented wheelchair access. As a result, the McElyeas bathed their daughter in the bathtub, which was becoming more difficult as she grew. Dreambuilder stepped in to help. By removing the curb and resetting the shower floor, we were able to create a ‘zero-entry’ floor to easily enable wheelchair access. Additionally, the doorway was widened to 3’, allowing easy access for the rolling shower chair the McElyea’s purchased for their daughter. Now, once she is in the chair, she can easily be rolled in and out of the shower. In addition to the main shower head, a second shower was added, a hand-held unit, making for easy bathing and care. 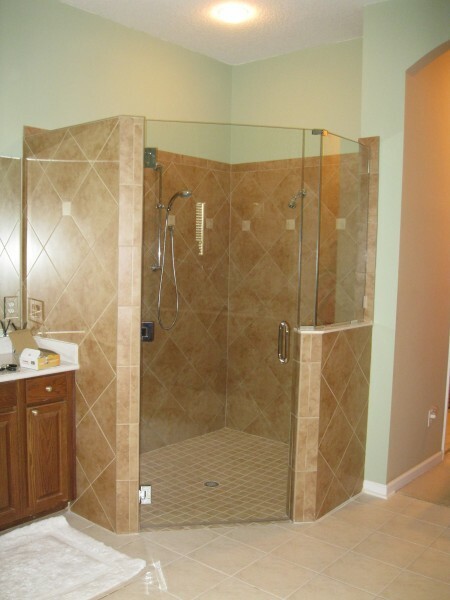 Since the shower is located in the master bath and is used by the McElyeas themselves, it was important that the shower not look institutional. “I wanted a walk-in shower that did not have that ‘handicapped’ feel to it but had the functionality that is required,” said Brian McElyea. The result is a beautifully tiled shower with decorative accents. A sleek, frameless glass enclosure raised the entire shower to a luxurious level and eliminated the outdated brass finish of the original. Built in shelving and a toe rest for shaving bring added convenience, and chrome plumbing fixtures by Moen add the finishing touch. To help integrate the new shower tile with the rest of the bathroom, the same tile was added around the master bathtub, creating a unified look to the entire room. Fresh paint and accessories complete the look. Dreambuilder can help you imagine and create the new master bath of your dreams. Contact us today to get started! PreviousPrevious post:Dreambuilder announces the completion of Dreambuilder Four, a custom home on Doctor’s LakeNextNext post:Read testimonials from three satisfied Dreambuilder clients!